Streets of Rage II was an influential beat 'em up from the glory days of the SEGA Genesis, featuring brutal hand to hand combat and some seriously good quality spritework. Relatively recently, it received the 3D Classics treatment from M2 and saw a re-release on the Nintendo 3DS; gloriously reproduced in autostereoscopic 3D. Naturally, the soundtrack is pretty catchy, too, and collectors will soon have a new method of owning all the music on it. Data-Discs has just announced that it will be releasing the soundtrack of Streets of Rage II on vinyl disc. Yuzo Koshiro – the game's lead composer – has collaborated with the company for the remastering process, and this edition includes original artwork, extra tracks, unreleased compositions. Pre-orders open on 27th February and it's expected to ship in early April. What do you think? Will you be ordering this? What did you think of Streets of Rage II? Share your thoughts in the comments below. This neo-vinylism phase is rather frivilous, but if there was any game's soundtrack that deserved to be on the format, it's this game (or its sequel). It just fits the party/club scene so well, even today. Unlike so many of these game-related releases on vinyl, the original composer is involved with its transfer, which, besides all the included extras, gives this release some actual value, unlike the purely gimmicky nature of most OST vinyls. If I was more of an audiophile, I'd actually consider getting this. Yes, even as someone who still owns all his '70s vinyl, I find it a little odd to see digitally performed/constructed music being redistributed in an analogue format. Having said that, it is a strangely compelling product, and it may even get the attention of a few DJs. By the way, anybody who wants all three SoR/Bare Knuckle soundtracks on CD should seek out the triple disc set "Yuzo Koshiro Best Collection Vol 2" (which also contains Revenge of Shinobi). I've bought other vinyl released by Data Discs and they are fantastic. They really do a proper job when it comes to remastering, and the pressing quality of the vinyl is great. They did an awesome job with the first Streets of Rage soundtrack was awesome and I'm sure they'll do the same again. Wow, wow, wow, hang on a minute. I assumed this was in Japan and I'd have to import, but it's a UK website?!?!?! I don't think I can pass this up! I'm going for the full set here so you bet I will be hitting the website on Satuday as hard as Axel's Grand Upper. I hope they put other Yuzo Koshiro works on vinyl in the future. 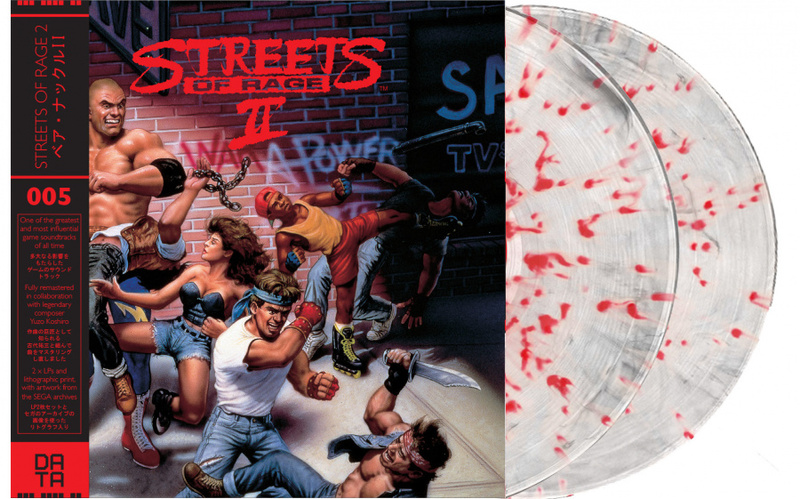 Nice this game has one of the best game soundtracks out there so it is definitely deserving of a vinyl release. ..funny I was playing this last night, with headphones ( I normally play with sound off ).. and thought the soundtrack sounds pretty good..but I'll just play it again for the tunes.. Seriously, one of my favorite games/soundtracks of all time. This is perfect for my beginning vinyl collection! I always wonder who these are for, do people just hang them on their walls or do they actually listen to them? Can we get some streets of rage 8-track and cassette tapes in the near future? People do both with them, really. In this case, this particular mix/master has been overseen by Yuzo Koshiro himself. Basically, this vinyl is gonna sound GODLY! @SmaMan Huh neat well if you're getting it enjoy man.